DIVERS involved in the rescue of 12 Thai boys and their soccer coach from a flooded cave have revealed extraordinary details of the dangerous operation. A team of more than 150 worked together to free the group from Tham Luang cave, a 10-kilometre long limestone cave system, in an operation that scared even the most seasoned professionals. "It's one of the most difficult and dangerous and risky things I've ever done, not in terms of my own personal safety, but in terms of the people I was responsible for," British cave diver Jason Mallinson told ABC TV's Four Corners. "I've never done anything as risky as that and I don't think I ever will again. But it was the only option we had, and we took it." Cave rescue that captured the world: Miracle Thai cave rescue of junior soccer team caught the world's attention. Mr Mallinson was a "recover diver" tasked with getting the children through some of the most dangerous flooded passageways, in water that was so murky there was sometimes no visibility. "The probability of success was about as low as you can get," US Mission Commander Major Charles Hodges said. "I was fully expecting that we would accept casualties. Maybe three, four, possibly five would die." For the dangerous three-hour long journey, each of the children was sedated to stop him from panicking. The rescue was so dangerous the Australian Government negotiated immunity from Thai authorities for any Australians involved in the sedation of the children in case anything went wrong. 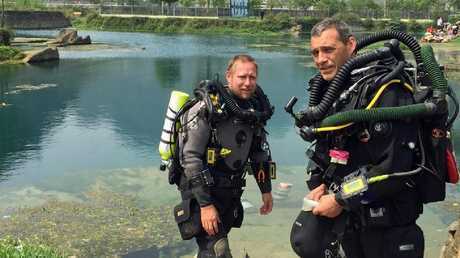 Retired Perth vet and cave diving expert Dr Craig Challen (right) with his Adelaide diving partner Dr Richard Harris. 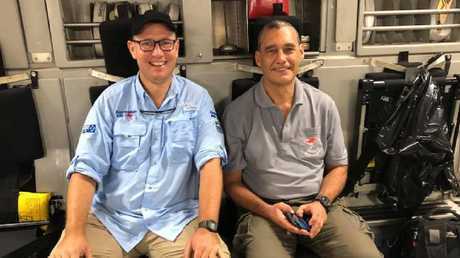 Expert cave divers Dr Craig Challen and Dr Richard "Harry" Harris have been hailed as Australian heroes for their pivotal roles in rescuing the Thai football team. Dr Harris in particular was described as a "linchpin" in the operation, helping to assess the children at different stages of the journey. The journey was broken up into nine sections and expert British divers were responsible for bringing them through the most complicated spots, using guide lines to help them navigate the passageways. "We'd submerge with the kid. And depending how the line laid, we'd either have them on the right-hand side or the left-hand side, either holding their back or holding their chest," Mr Mallinson said. He describes the process as "mentally exhausting", especially on the last day when there was no visibility. "I had to have the lad really close to me because if you didn't, you were bashing his head against the rocks," he said. "If we bashed him against a rock too hard and it dislodged that mask and flooded his mask, he was a goner. So that's why we had to be very slow and careful about not banging them against rocks." Rescued Thai schoolboys in hospital after cave ordeal: Rescued Thai schoolboys waving and smiling as they recuperate in hospital after frightening cave ordeal. Instead Mr Mallinson said he extended his head above the boy's so that his head hit the rocks instead. "The visibility was that bad, you couldn't see the rock until you actually hit it," he said. Earlier divers had rehearsed the rescue in a local pool, practising the manoeuvres with volunteer children and assessing whether the risky operation was feasible. "I was confident of getting myself out, I was confident of not losing control of the line, I was confident of getting the kid out (but) I wasn't a 100 per cent confident of getting him out alive," Mr Mallinson said. At some points the children had their scuba gear taken off and were taken in stretchers across some areas. In other areas they were carried in harnesses across very steep caverns as walking across these muddy areas would have been dangerous. Two divers were assigned to each child so that at least one was always holding on to the child. Australian diver, Dr Harris, assessed the children at different stages of the operation to ensure they were OK to continue. "Without him, we wouldn't have been able to do what we did," Mr Mallinson said. "His bedside manner when he was there with the kids and that, talking to them, calming them down and stuff like that. 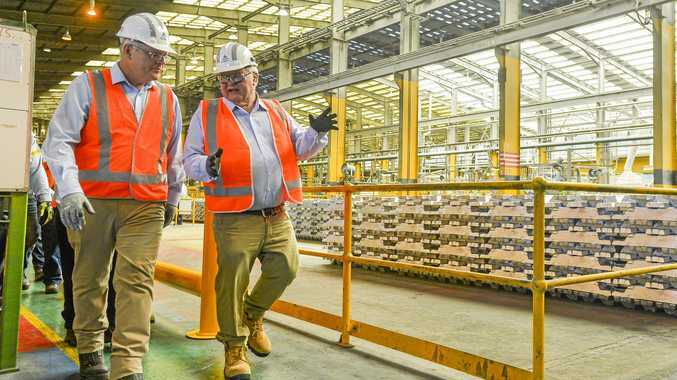 "So yeah, he was the, the linchpin of the operation." While it's been reported that Dr Harris also decided which children came out first, fellow Aussie diver Dr Callen said this wasn't true. He said it was the decision of the boys, coach and Thai Navy SEALs who were with them. The group was told about the operation and they decided who came out first. "Harry did not choose them as has been suggested. So, I think it was their bravest guys that came out first." Dr Challen, a retired vet from Perth, also revealed he almost missed the crucial phone call from the Thai Government seeking their help. "I (was) packed up ready to go for a trip to the Nullarbor," he said. "Harry and I were on the way the next day. And so, I had 45 minutes to head to the airport. "In that time, I had to unpack everything that I had, reconfigure and get the gear that I needed for this trip and go." It was also revealed that the decision to rescue the Wild Boars team by diving them out was a last resort. Major Hodges said it might have taken four to five months if they waited until the water receded. "If you go at minimum rations of one meal a day, we were looking at numbers about 1800 meals that we needed to get in there," he said. "So, there was not the physical space in the cave to put 1800 meals and that would be 18 separate dive missions. "We knew that that wasn't an option because the rains would come too soon for us to be able to execute all of that." Various other extraction methods were proposed, including drilling or placing the boys in nylon pods with air tanks, but the dive method was ultimately decided as the best option. "I mean we're so incredibly overjoyed that not only is it a good news story, but at the end of the day we got the kids back together with their parents, and that's what matters in my mind," Major Hodges said.